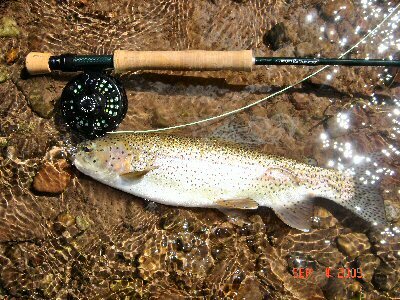 The Fork fishes extremely well during summer, with caddis, green drakes and pale morning duns being the predominate hatches. Midges are ubiquitous and the BWO's are always an option as well. There are also yellow sallies and terrestrials. 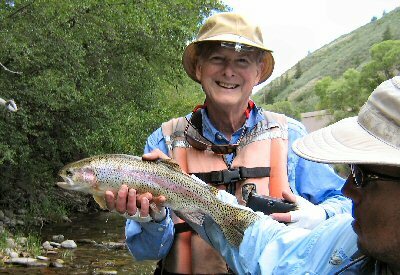 The hatches will start from down in the Colorado and move up the Fork as the weather warms and the water temperature rises. It is a great time to float. As the water level falls, floating will become more difficult up higher. Our guides use rafts rather than boats to enable them to access great water up higher during this period. As the run-off ends, floating will be forced lower towards Carbondale and Glenwood. So if you are interested in floating and have a choice of times, try and get onto the water just after run-off but before the water warms in the heat of summer. Call the shop to get an indication of water levels and what the guides are recommending. The green drakes will move up the Fork in late June through July. Our drainage enjoys the longest green drake hatch in the country. The green drake is a very large greenish may fly size #12 to a size #10. In late July provided there is sufficient moisture about, each afternoon will see a gathering of heavy clouds and the possibility of a little rain. This means several things. First take along some rain gear, particularly if you a floating for the day. After the rain, hatches are great. Cloudy days see the best mayfly hatches. It takes longer for the wings to dry, so there is a greater opportunity for fish to feed. It is interesting whether the hatches are more prolific on the cloudy days or merely appear so because the hatching mayflies sit on the water longer. I suspect that the former is the case. On cloudy days with intermittent bright sun, when the mayflies hatch their wings will burn producing more cripples. So it seems that they respond to the conditions and prefer cloudy cover. At the same time there will be PMD hatches. One in the morning and a bigger one in the evening. These flies vary from a size #20 to a size #16. The main spinner fall occurs in the evening with the falling temperature. The BWO's also come off over this period. It hatches in abundance from May through to October. Emergers work well down towards Glenwood in July and August. If the water gets a little warmer down lower towards Glenwood, there is a tendency for slime to grow on the bottom, inhibiting fishing deep with nymphs. Adjust your weight so that the nymph drifts free above the bottom at this juncture. When the sun is bright look in the shady areas or in the evening for the caddis to hatch. The period from 7:30 p.m. until dark is the best. Being a freestone river the Fork has better caddis hatches than the Pan. Fish with pupae as well as dries into the evening. When all else fails in the middle of a hot day, try san juan worms. Terrestrials are always worth taking along, in particular hoppers. They are great for those larger trout lying in wait and work well as strike indicators when fishing a nymph dropper. 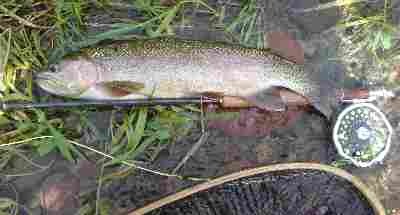 If the wind picks up a big trout will be waiting for a hopper to splat onto the surface. Don't dissapoint him. We carry a large range of hoppers in the shop because we find that the fish can become selective distinguishing between colors and sizes for no apparent reason. I have changed a pattern 5 or 6 times before finding the one that the trout will key in on. Then the next time it is different, and one has to find the next hopper. As a strike indicator, the parachute hoppers are highly visible and are effective as a fly. In addition always be prepared to try a beetle or an ant if fishing near overhanging brush and grasses. Splash the fly on the surface to attract attention. At the height of summer and on the hot bright days, the fishing will slow down a little in the afternoon. The fish will get a little more lethargic towards Glenwood in particular. So be prepared for a long day with a few quiet periods. But to be sure if you are prepared to put in the time on the river and take note of the hatches, you will be rewarded. At this time, floating in a raft comes into its own higher up. The higher up you get, the clearer the water. As you get lower down, irrigation ditches and various tributaries such as the crystal will add volume and color to the water. However, up higher, the water will be too shallow for the hard boats. As the water gets more shallow, even the rafts will have difficulty. However if you have a small one or two man pontoon craft, you will still be able to access great fishing water if you are prepared to rope your craft over some of the rapids. It is worth it. You will be alone on the river. You could be anywhere. One thing to note, is that given that the raft in shallow water entails a lot more work on the part of the guide than the drift boats lower down, there is much less traffic higher up. Many guides just won't put in the effort in a raft. They will offer excuses or generally indicate that the fishing is great lower down the Fork. Don't be fooled. Fishing from a raft higher up when no-one else appears to be on the river is an absolute delight, and the fishing always seems to be better. At least that's my view and I'm sticking to it! Late in Summer when the weather begins to cool, and there is a hint of change in the foliage, the rains and cooler evenings will cool down the water. The larger hatches abate, so the fish are less able to pick out the big bugs for a big meal. The BWO emergers and nymphs behind a dropper will work particularly well during this period. There will be sporadic hatches, but the nymphs are always in the water so fishing a nymph/emerger combination will cover a lot of possibilities. Taken 4th September2005 on a #18 sparkle baetis nymph behind a #12 Royal Stimulator. spinners - rusty spinner patterns. duns - parachute Adams #18 - #24; mathews #22 - #24.